Attention runners! Are you taking all the necessary precautions to avoid injuries? Use this checklist to make sure you are on the right track to continue running injury-free well into the future. Do you properly warm up and cool down? Take 5-10 minutes before each run to warm up. I recommend a mix of foam rolling and dynamic stretches. Dynamic stretching is when you move the joint through the full range of motion. It is an active stretch, unlike a static stretch that you would hold for 30 seconds. Great dynamic stretches before running are leg swings, walking lunges and squats. After your run take 5 minutes for static stretching (hold each stretch for 30 seconds). Do you wear running-specific shoes and replace them every 500 miles? A good pair of running shoes will provide the support you need to run safety and help prevent injury. If you are putting in significant miles each week, like someone who is training for a marathon, I would recommend having two pair of running shoes and rotating the shoes every other run. Mark on your calendar (or in your training log) when you buy new shoes and keep track of the milage. Replace every 500 miles. Do you build distance and intensity gradually, no more than 10% a week? One of the big mistakes runners make is doing too much too soon. Listen to your body. Build your milage gradually, never more than 10% increase a week and every fourth week, reduce your milage. Building milage slowly is the best way to prevent injury. You'll hopefully be running long into the future, there is no need to rush anything. Do you avoid increasing both distance and intensity in the same week? If you add additional miles to your training log, don't also add increased intensity speed work. I usually block my training cycles to meet specific goals, I am either training to increase milage (like for a half marathon) or to improve speed, but never both in the same week. Do you limit speed work and hard effort sessions to 2-4 times a week? Most runners need just 2-3 days a week of effort sessions. Effort sessions include anything outside of easy runs, for example, hill repeats, fartleks, speed work and long runs. Doing too much only leads to injury. Listen to your body. Do you rest between hard workouts? Always allow 1-2 rest days or easy run days between hard workouts. Never do hard workouts back to back. Remember that adaptations occurs during rest. If you never rest, you never get stronger or faster. More is not always better. Do you fuel properly for running? Your body literally runs (pun intended) on the fuel you give it. If you don't fuel properly, you'll see it in your results. Runners need carbs and calories for energy, protein for muscle repair, and fat. Eat to perform. Work to include nutrient dense foods in your diet for the best results. Do you strength train and/or cross train? Ah, my favorite topic. It's so important to me that I built my business around the notion that runners who strength train are stronger faster runners. You don't have to spend hours in the gym, but carving out a little time for strength training and cross training will help reduce your chance of injury from running. Do you get 7-8 hours of sleep a night? Sleep is so important. Not getting enough sleep, less than seven hours of sleep per night, can reduce the benefits of running. Your body needs the time to recover. Lack of sleep can cause you feel unfocused, hungry and, despite your running efforts, not achieve results. When you don't get enough sleep, your stress hormone levels can rise, which can be associated with fat gain. Aim for 7-9 hours a sleep a night to maximize your efforts and reduce the chance of injury. If you answered yes to all the above questions, congratulations! You are taking the necessary precautions to help avoid injury. Did you fall short anywhere? If so, tackle one point at a time and work to improve gradually until you check yes for all the questions. You can download the checklist here in PDF format! 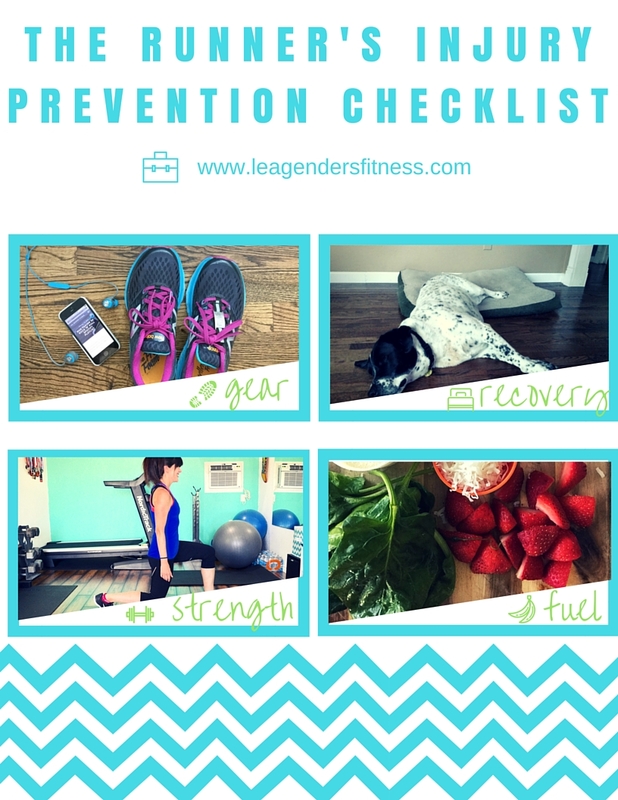 download the injury prevention checklist here! Any questions? I'd love to help! Let me know in the comments. Like this post? You can help me out by sharing! Shuffle Up Your Workout with a Deck of Cards! Welcome to Workout Wednesday! No one ever said working out had to be boring. As a bootcamp instructor I am always looking for ways to keep our sessions fun and interesting. There are lots of way to add a game component to your workouts. For this one we are going to use playing cards for a fun full body workout challenge. Shuffle up your workout with a deck of cards. When I was a young girl one of my boy cousins approached me with a deck of cards and asked me if I wanted to play a game called 52 pick-up. I was excited my much older cousin wanted to play a game with me. When I enthusiastically agreed to play, he threw all the cards on the floor and walked away, "There are 52 cards, now pick them up." Jerk. That is a trick you only fall for once. I promise my workout won't be a trick, but I can almost guarantee you'll be working to pick yourself up off the floor after this one. Shuffle the cards, place them face down in a stack, then choose the first card off the top. Set your timer for 20 minutes and complete as many cards as you can in that timeframe. You perform the number of repetitions on the card. For example, if you flip over a 4 of hearts, you perform 4 pushups. 6 of diamonds means you do 6 squats. King, Queen, Joker and Jacks = 12 reps each. Start in a high plank position with your hands placed a little wider than your shoulders. Keeping your body in a straight line, while engaging your core slowly lower your chest to the floor. Once in the low position, push back up to the starting position. If this is too challenging, drop to your knees. Start by lying on your back with your knees bent at a 90 degree angle. Push the small of your back into the floor. Contract your abs while breathing normally and lift your shoulders and upper back off the floor a few inches. Hold in the top position for 3 counts before lowering back to the floor. You could also use a stability ball for this exercise, follow the above instructions but positioning a stability ball under your lower back. Start with your feet hip width apart, lower into a squat position until your hands are flat on the ground in front of you. Jump your legs backwards into a high plank position. Jump both feet forward so you are back in the squat position. Jump up and raise both hands over your head. If this is too challenging, step back and forward from plank position instead of jumping. Don't be tempted to skip cards. Since there are only four exercises, you may find yourself doing the same exercise several times in a row. That's ok, you are building endurance. Work to complete the reps on the cards only resting for as long as it takes you to flip the next card. The goal is to keep moving for the entire 20 minutes. Since the clock is ticking, you want to maximize your time. All of these exercises can be completed using only your bodyweight, but you can challenge yourself further by adding weights to the exercises. See how many cards you can get through in twenty minutes. I'd love to know, send me a message on Twitter or leave a note in the comments. You could make this a partner challenge by competing with a friend to see who can get through the most cards in 20 minutes. Just remember that proper form is always more important than speed. Rushing through the exercises with improper form will make them less effective and you could risk injury. Play smart! Please remember that while I am a personal trainer, I am not your personal trainer who knows your medical history, exercise background and unique needs. Please consult with your doctor before beginning any new exercise program. Any questions? I'd love to help. Let me know in the comments. Welcome to the latest edition of Running A-Z where I cover a running-related topic following the order of the alphabet. Missed some posts? You can catch up on letters A-I here. When I started this series, I worried this would happen. I worried I would come upon a letter that did not have an obvious running-related topic. J? Jogging? Jokes? I was sort of lost. Instead of burdening (or delighting) you with my running jokes (I think I'm hilarious) I decided to talk to you about the importance of journaling for runners. I am a blogger and a writer at heart, so it is very natural for me to journal my runs and workouts. Journaling your runs includes documenting more than just how many miles you ran and at what pace. When you journal your runs you write about how you felt during your run, what the weather was like, the time of day, how you fueled and how you felt after. But even if you have never journaled before, there are great reasons why you should start a running journal today. Writing you goals and plans down on paper is the first step in achieving them. So whether you are training for a half marathon, a faster 10k or your first 5K, having a written plan and goal serves as a daily reminder to stay on track and can be a motivator to do the work required to achieve that goal. A journal can hold you accountable to your goals. Writing about your daily runs help you track improvements. Sometimes improvements may come slowly and you may feel like you are not improving at all. Being able to track your progress from week to week, month to month and year to year show you that while sometimes changes have been slow, they have been occurring. I tend to forget every summer that the debilitating Texas summer heat slows me down and get mad at myself for my slower pace in 90% humidity. A running journal helps remind me of my paces and conditions from last summer so I can make comparisons based on similar conditions. I can't always count on my brain to remember. Journaling helps you monitor how you feel during and after a run and the factors that can affect it. Maybe you notice that you always feel drained with "heavy" legs on early morning runs, but feel fast and efficient in the afternoon. That may mean your body doesn't respond well to running on an empty stomach in the morning. Maybe you notice you have better runs after a moderately high carb dinner. Journaling may reveal that too many speed work sessions in one week leaves you feeling drained and overworked. Maybe adding an extra tempo run in a week improves your half marathon pace. It's hard to know what is working or not working until you track and monitor it. I noticed that if I ran more than two days in a row, I would experience some hip pain. I backed off running on that third day for rest and the hip pain went away. The journal helped me see that pattern and I changed my training plan to fit my needs. A journal can help you experiment with what is working, and not working for you. When you document how you feel, you can see the trends over time and make adjustments as needed. I am a big fan of self-celebration. Too many things in this world can bring us down, let us remember to celebrate our achievements, both big and small. If I completed every workout on my plan for the week, that is cause for celebration! If I achieved a PR or even crossed a finish line without dying, let's celebrate. A journal helps you document those successes so that on those days that you are dealing with self-doubt or negative feelings you can turn to your journal to remember your past successes. All you need to get started is a notebook. Some people may prefer an app like Daily Mile, but call me old fashioned (or just old) but I prefer the pen and paper method. There is something that works for me when sitting down with a pen and notebook to document my experience. All you need to get started is a regular notebook, but If you want to get fancy, I recommend the Believe Journal. It is training log designed by professional runners that is chalk full of motivation and inspiration. Best news? I have one for you to win in a giveaway. There are many ways to earn entries. Just complete one or complete them all for a better chance of winning. Good luck, friends! Thanks for tuning in for another edition of running A-Z. Have any suggestions for future topics following the order of the alphabet? What do you want to learn more about? Let me know in the comments! Like this post? Please consider sharing! All Rafflecopter entries will be verified. If entry not completed, a new winner will be selected. There are a lot of legitimate reasons not to workout. Maybe your doctor told you not to, maybe you needed your sleep, maybe you have an injury or you're sick. The key is to be honest with yourself so you can determine when you miss a workout if you are making excuses or you legitimately need to rest. As the saying goes, "The only thing standing between you and your goal is the bull$hit story you keep telling yourself as to why you can't achieve it." Maybe a nicer way of saying that is that sometimes we need to get out of our own way. We make these excuses why we can't workout, then we believe them. It all starts in our heads. Believe you can do it first. Then do it. This one is easy to debunk because it really doesn't take a lot of time to fit in exercise in your life. Maybe you legitimately don't have an hour a day to workout but fitting in 20-30 minutes a day is all you need. Try getting up 30 minutes earlier in the morning or squeezing in three separate ten minutes workouts through out the day. Yes, that counts. Take your dog for a walk. Do pushups during commercials of Game of Thrones or lunges while you're waiting for the microwave to ding. It doesn't have to be structured and scheduled. Move your body. Check out my workout archive for plenty of quick workouts that are 4-15 minutes long. Something is always better than nothing. "I can't afford a gym membership"
A gym membership may sound like the ideal workout environment with a 24 hour schedule, a pool, sauna and treadmills for all. But a gym can also be crowded, expensive and intimidating. While it may be nice to have the convenience of gym, it simply is not necessary to get in shape. If you can't afford a gym membership you can do workouts at home with DVDs, look up free workouts on You-Tube or follow my workouts every Wednesday for #workoutwednesday. There a ton of free resources on the internet and you can get an effective full body workout with no equipment except your own bodyweight. No gym membership needed. "I'm too Old or OVERWEIGHT"
I recommend speaking with your doctor before beginning any new exercise program, but using your age or current weight as an excuse not to exercise is just a cop out. Once your doctor gives you clearance to workout this excuse is debunked. A fitness professional can help develop a safe and effective program for any age or fitness level. Not everyone needs to join CrossFit to get in shape, there are plenty of low-impact workout plans that will be effective for you at your current fitness level. If you are not sure where to start, work with a professional to help you reach your goals. Exercise is physical movement with the purpose to improve health and fitness. Maybe you hate running. Maybe someone dragged you to a fitness boot camp once and you almost died (jokes!). That's OK. There are plenty of ways to move your body. The key is to find the thing that you enjoy and stick with it. Some people like walking, some people like tennis. My dog loves to run so I indulge him. There are many paths to fitness. There is no need to follow the traditional route. It may take some experimenting, but try some fitness classes, round up some friends for a hike or jump on a bike with your kids. There is something out there for everyone. "I don't have child care." "My kids keep interrupting me." "I have to drive my kids to...."
I get it. No matter what their age, kids keep you busy. Sometimes (OK most of the time) they need your attention. You can barely use the bathroom without them pounding down the door, let alone get away for an hour to workout. But kids can be a great motivator to exercise. You want to be healthy so you can keep up with them and be around for them for years to come. Whether they are 5 or 15, getting them involved in exercise is a great way to lead by example and be a role model for a healthy lifestyle. Maybe it's a family bike ride, hike or tag football in backyard. Teaching your kids that exercise can be fun, is a good way to remind yourself. There's one thing that always sticks with me when I catch myself making excuses as to why I can't do something. I think it's human nature, we rationalize our bad decisions. I once told my sister that I can't get myself out of bed to workout in the morning anymore and she said, "It's not that you can't, it's that you choose not to." It's true, if I turn off the alarm and roll over to go back to bed instead of working out, I made a choice. Works towards making the choices that bring you closer to your goals, rather than making excuses that set you further behind. Like this article? Please consider sharing. Need help with motivation? Maybe I can help! Welcome to another edition of Workout Wednesday. Each week I give you a new workout that is quick and effective. If your excuse for not exercising is that you don't have enough time, I have that excuse debunked! Most of the circuit style workouts I share are from 4-15 minutes. You can make time for that, right? I am returning from a long weekend at the IDEA World Fitness convention. I had a great time soaking up the knowledge and connecting with my fellow fitness professional and bloggers. It can be hard to squeeze in a workout when you're traveling. This workout is a perfect bodyweight workout that takes up little space and little time. You could knock it out on the floor of your hotel room or whenever you have limited time or space. This is a ladder workout that combines a strength move with a cardio move. You count up reps of the strength move from 1-10 and count down on the cardio move from 10-1. For example, in this first circuit, you would complete 1 rep of a pushup and 10 reps (each leg) of a mountain climber. Then you would move on to 2 reps of the pushups and 9 reps (each leg) of a mountain climber. Then 3 push-ups and and 8 mountain climbers and until you worked your way up to 10 reps of the push-up and 1 rep (each leg) of the mountain climber. There are just two moves in this circuit. The push-up and the mountain climber. Start in a high plank position with your hands placed a little wider than your shoulders. Keeping your body in a straight line, while engaging your core, bend your elbows slowly to lower your chest to the floor. Once in the low position, push back up to the starting position. If this is too challenging, drop to your knees. Start in a high straight arm plank position with your wrists directly under your shoulders with your legs wider than hip width for stability. Keep your body in a straight line from your shoulders to ankles while engaging your core. Do not allow your hips to hike up or sag down. Quickly bring your right leg, then your left leg in to touch your elbows. Right then left equals one rep. This is a great format for strength and cardio in one workout. You could make it a full body workout by completing this circuit then switching up the exercises to a squat and high knees! It's important to remember that while I am personal trainer, I am not your personal trainer. Please speak to your doctor before beginning any new exercise program. Have questions? I'd love to help!